Findings by UT Southwestern Medical Center researchers may suggest new strategies for successful donor adult stem cell transplants in patients with blood cancers such as leukemia, lymphoma and myeloma. The piezotronic memory devices developed by Wang and graduate student Wenzhuo Wu take advantage of the fact that piezoelectric materials like zinc oxide produce a charge potential when they are mechanically deformed or otherwise put under strain. These PRM devices use the piezoelectric charge created by the deformation to control the current flowing through the zinc oxide nanowires that are at the heart of the devices — the basic principle of piezotronics. The charge creates polarity in the nanowires — and increases the electrical resistance much like gate voltage in a conventional transistor. The piezotronic switching affects current flowing in just one direction, depending on whether the strain is tensile or compressive. That means the memory stored in the piezotronic devices has both a sign and a magnitude. The information in this memory can be read, processed and stored through conventional electronic means. The zinc oxide nanowires, which are about 500 nanometers in diameter and about 50 microns long, are produced with a physical vapor deposition process that uses a high-temperature furnace. The resulting structures are then treated with oxygen plasma to reduce the number of crystalline defects — which helps to control their conductivity. The arrays are then transferred to a flexible substrate. Wang believes this new memory will become increasingly important as devices become more closely connected to individual human activities. The ability to build these devices on flexible substrates means they can be used in the body — and with other electronic devices now being built on materials that are not traditional silicon. Preschool children consumed nearly twice as many vegetables and 11 percent fewer calories over the course of a day when researchers from Penn State added pureed vegetables to the children’s favorite foods. According to Spill, the children ate the same weight of food regardless of the vegetable content of the entrées. And when they ate the vegetable-enhanced entrées as opposed to the standard-recipe entrées, their daily vegetable intake nearly doubled while their calorie intake decreased by 11 percent. The team’s findings are online in the American Journal of Clinical Nutrition. Researchers at the Georgia Institute of Technology have designed a multiple-compartment gel capsule that could be used to simultaneously deliver drugs of different types. The researchers used a simple “one-pot” method to prepare the hydrogel capsules, which measure less than one micron. The capsule’s structure — hollow except for polymer chains tethered to the interior of the shell — provides spatially-segregated compartments that make it a good candidate for multi-drug encapsulation and release strategies. The microcapsule could be used to simultaneously deliver distinct drugs by filling the core of the capsule with hydrophilic drugs and trapping hydrophobic drugs within nanoparticles assembled from the polymer chains. Details of the microcapsule synthesis procedure were published online on July 5, 2011 in the journal Macromolecular Rapid Communications. 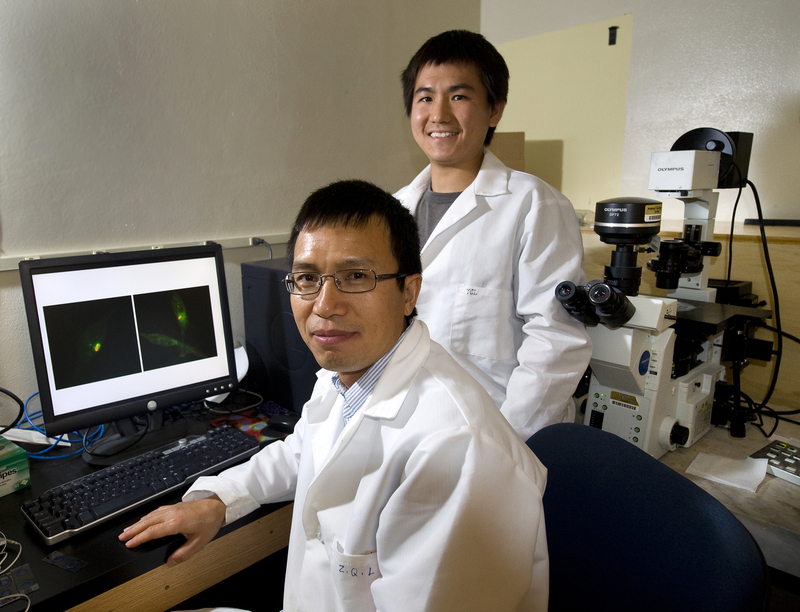 Lyon and Xiaobo Hu, a former visiting scholar at Georgia Tech, created the microcapsules. As a graduate student at the Research Institute of Materials Science at the South China University of Technology, Hu is co-advised by Lyon and Zhen Tong of the South China University of Technology. Funding for this research was provided to Hu by the China Scholarship Council. The researchers began the two-step, one-pot synthesis procedure by forming core particles from a temperature-sensitive polymer called poly(N-isopropylacrylamide). To create a dissolvable core, they formed polymer chains from the particles without a cross-linking agent. This resulted in an aggregated collection of polymer chains with temperature-dependent stability. “The polymer comprising the core particles is known for undergoing chain transfer reactions that add cross-linking points without the presence of a cross-linking agent, so we initiated the polymerization using a redox method with ammonium persulfate and N,N,N’,N’-tetramethylethylenediamine. This ensured those side chain transfer reactions did not occur, which allowed us to create a truly dissolvable core,” explained Lyon. For the second step in the procedure, Lyon and Hu added a cross-linking agent to a polymer called poly(N-isopropylmethacrylamide) to create a shell around the aggregated polymer chains. The researchers conducted this step under conditions that would allow any core-associated polymer chains that interacted with the shell during synthesis to undergo chain transfer and become grafted to the interior of the shell. Cooling the microcapsule exploited the temperature sensitivities of the polymers. The shell swelled with water and expanded to its stable size, while the free-floating polymer chains in the center of the capsule diffused out of the core, leaving behind an empty space. Any chains that stuck to the shell during its synthesis remained. Because the chains control the interaction between the particles they store and their surroundings, the tethered chains can act as hydrophobic drug carriers. Compared to delivering a single drug, co-delivery of multiple drugs has several potential advantages, including synergistic effects, suppressed drug resistance and the ability to tune the relative dosage of various drugs. The future optimization of these microcapsules may allow simultaneous delivery of distinct classes of drugs for the treatment of diseases like cancer, which is often treated using combination chemotherapy. Engineers at UC San Diego are mimicking the movement of bird wings to help improve the maneuverability of unmanned aerial vehicles (UAVs). energy for propulsion and reducing operational time. In addition, the aircraft may need to loiter at significant altitudes to avoid detection, and thus require complex sensors to observe the target far below. Rotary wing aircraft may be able to land on a perch for surveillance, but are generally less efficient for cruising flight than a fixed wing solution. A fixed wing aircraft capable of spot landing on a perch (top of a pole, building, fence, etc.) would be an ideal solution capable of efficient cruising and versatile landing for longer surveillance missions. Because the target is nearby, simple sensors could be used onboard the perched aircraft. The problem of perching has already been solved by nature. Birds routinely land on small surfaces, using wing morphing and flapping techniques. The UC San Diego engineers, led by mechanical and aerospace engineering professor Tom Bewley and graduate student Kim Wright, analyzed in slow motion several videos of birds landing to generate a working hypotheses for how wing morphing and flapping can be used for spot landing. “One of the key behaviors observed in the birds was their use of wing sweep for pitch control in both forward flight and stalled landing approaches,” she said. “Birds can move their wings in a myriad of ways, providing a level of aerodynamic control that is unmatched by UAVs,” Wright said. To verify their hypotheses, Wright and her team built a small remote controlled UAV with variable wing sweep and tested it using computer modeling, and an onboard microcontroller as a flight data recorder. Their initial testing validated the concept of using wing sweep for pitch control of the aircraft. The biologically-inspired aircraft design is similar in scale to the birds the engineers observed (barn owl, hawks, large parrots, crows) and has similar wing loading and airfoil characteristics. The fuselage and tail surfaces of the prototype UAV were primarily constructed from balsa wood and foam using standard hobby aircraft construction techniques. The wings were formed using composite construction utilizing carbon fiber, fiberglass, high density foam, and rip stop nylon. Carbon fiber tubing was used for the shoulder joint structure, and fiberglass reinforcement was used in heavily stressed areas on the fuselage. Future research could address combining wing twist, flapping, or other wing morphing aspects of the perching problem that UAVs currently have. Being able to perch UAVs autonomously on features in the environment (tree tops, buildings, telephone poles, etc…), and then to take off again as required, is an immensely valuable and significantly increases mission duration. Wright said the future of UAVs is diverse. UAVs are quickly becoming popular tools for the armed forces, but there are also a myriad of civilian applications, which are rapidly developing, such as wildfire monitoring, search and rescue, and traffic observation. “The technology is out there, and once federal aviation regulations are able to safely accommodate UAVs, I believe we will start seeing a lot more of them,” she said. A clinical trial for a new technology to diagnose and treat prostate cancer marks the first time Purdue University has directed the entire pathway of a therapeutic product from early research to patient treatment. company that takes it through the pipeline of preclinical studies, manufacturing and then clinical trials, said Timothy Ratliff, the Robert Wallace Miller Director of the Purdue University Center for Cancer Research who is leading the project. Eventually most therapeutic treatments developed at Purdue will have to be sold to a company in order to be manufactured and widely distributed. The further along in the process a product is, the better it is for the university and the state, he said. The ongoing clinical trial is testing the combination of a radioimaging agent and a prostate cancer-targeting molecule developed by Philip Low, Purdue’s Ralph C. Corley Distinguished Professor of Chemistry. Low and his research team designed a targeting molecule that seeks out and attaches to prostate-specific membrane antigen, or PSMA, a protein that is found on the outer membrane of the cells of more than 90 percent of all prostate cancers. Ratliff and Low are working with scientists and physicians at the Indiana University School of Medicine and the Indiana University Melvin and Bren Simon Cancer Center to perform the clinical trial. The clinical trial is the first to test the technology in humans and will evaluate the targeting molecule’s ability to recognize prostate cancer and deliver an imaging agent. The patients included in the study have prostate cancer that can be seen by computerized tomography scan, or CT scan, so that it can easily be determined how well the radioimaging agent is reaching the cancerous tissue. Dr. Thomas Gardner, the urologist at the Indiana University Melvin and Bren Simon Cancer Center who treats the patients involved in the trial, said the technology may help reduce unnecessary procedures and allow other treatments to be given earlier. There is currently only one radioimaging agent for prostate cancer approved by the Food and Drug Administration. The targeting molecule and radioimaging agent combination designed by Low’s group is more than 150 times smaller than the existing agent and can much more easily penetrate a solid tumor to reach all of the cells inside, he said. Three patients currently have been treated in the clinical trial that will include around 25 patients. The trial should be complete in about a year, Low said. Dr. Song-Chu Ko, in the Department of Radiation Oncology at the IU School of Medicine and a member of the IU Melvin and Bren Simon Cancer Center, leads the clinical trial. In addition to Gardner and Ko, the IU team also includes Noah Hahn of the Department of Hematology and Oncology, Peter Johnstone of the Department of Radiation Oncology, James Fletcher of the Department of Nuclear Medicine, Michael Koch of the Department of Urology and Gary Hutchins of the Department of Radiology. The research will be published in an upcoming print issue of the journal Plant Physiology and is currently available in the journal’s online edition. “A hike in dry areas, such as the Santa Monica Mountains, proves that leaves can be small. But if you are in the tropical forest, many leaves are enormous,” said Lawren Sack, a UCLA professor of ecology and evolutionary biology and senior author of the research. This biogeographic trend — smaller leaves in drier areas — may be the best recognized in plant ecology, true at both the local and global scales, but it had evaded direct explanation, Sack said. Sack and his research team focused on deciphering the meaning of the huge diversity in the patterns of veins across plants. They found that small leaves’ major veins — those you can see with the naked eye — are spaced more closely together and are of greater length, relative to the leaf’s size, than those of larger leaves. This redundancy of major veins, the researchers say, protects the leaves from the effects of embolism — bubbles that form in their “water pipes” during drought — because it provides alternate routes for water to flow around vein blockages. “Even with strong drought that forms embolism in the veins, a small leaf maintains function in its vein system and can keep functioning for water transport,” Sack said. To do this, plants need to maintain the continuity of water in their “pipe delivery system,” even as water is being pulled up by the leaves to replace water that has been lost to the air. This places tension on the water in the pipe system, known as the xylem, which runs through the roots and stem and into the leaf veins. And that continuity is challenged by dry soil, Sack explained. To test this idea, the UCLA team collaborated with professor Hervé Cochard from France’s University of Clermont-Ferrand and a member of the Institut National de Recherche Agronomique, to construct three-dimensional computer models of leaves’ venation systems. They then simulated the impact of embolism on water transport for leaves of different sizes and vein architectures. The biologists found a distinct difference in function between the major veins, which tend to show a branching pattern, and the minor veins, which form a grid embedded within the leaf and make up most of the leaf’s total vein length. Blocking the major veins had a huge impact on leaf function — but one that could be remedied by having additional, redundant major veins. “If an air bubble forms in the leaf’s water pathway, the more alternate highways the vein system has to offer, the less the leaf will be affected by these accidents,” Scoffoni said. The UCLA biologists — including co-authors Michael Rawls, an undergraduate student, and Athena McKown, a postdoctoral scholar in ecology and evolutionary biology — tested diverse leaves from very wet and dry areas, all planted near the UCLA campus. The leaves fit the pattern: The biologists found that smaller leaves indeed had more tightly packed major veins and were more resistant to the effects of embolism in the major veins. The were better able to maintain water transport, even during extreme drying, Sack said.